I don't like fried eggs. They give me heart burn. The only way I enjoy fried egg is when the egg yolks are taken out. Note: the strawberries in the photo above are not part of the recipe. Cut the tomato into small pieces. I prefer removing the seeds. Cut the onion into thin slices. The onions should be the same quantity as the tomato (after cutting them). Break the eggs and remove the egg yolks. Add salt to your taste and mix. If using fresh pepper, cut into tiny pieces. Place the sliced tomato, onions and pepper into a bowl and season with a pinch of salt. Set your frying pan to heat up. Pour the vegetable oil into the pan and make sure that the oil greases every part of the pan. When hot, reduce the heat of your stove to low and pour the egg whites into the pan. Sprinkle the pepper, onions and tomatoes on top. You need to do this immediately before the egg whites cake. This is so that part of these ingredients will be buried in the egg whites when it cakes. Leave till the egg whites are completely caked. You can confirm this when it is white all over. If your stove is on very low heat and if you are using a non-stick frying pan, this will happen without the egg burning. Once it has caked completely, shake the frying pan and the omelette moves on its own. If it doesn't then it is either the heat is too much or the inside of your frying pan is too rough or both. Gently transfer the omelette to a very flat wide plate. And that's it! Watch the video below to see how I did mine. 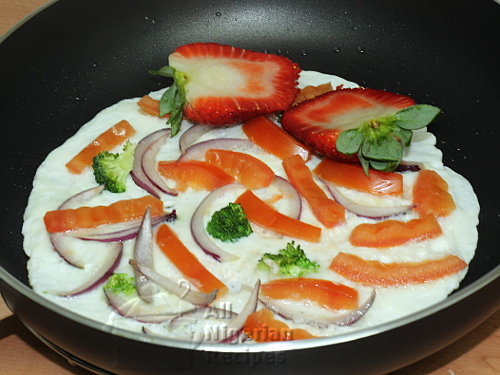 If you have any questions about preparing the Egg Whites Omelette, click here to ask me.